A Gold Pass member asked me whether it is possible to insert a strategy into a chart after a bar is clicked. It is actually quite easy to do this in TradeStation using the ChartingHost class and a macro, although I suspect it is not something that would have a widespread application. However it may be more useful to be able to output the bar number of a bar that was clicked, as well as its date and time. For example, if you were trying to debug a program applied to a chart which contained a lot of history, it would be convenient to be able to click on a bar to get its bar number and date time signature. Of course, the other purpose of this tutorial is to attempt to explain programming constructs. 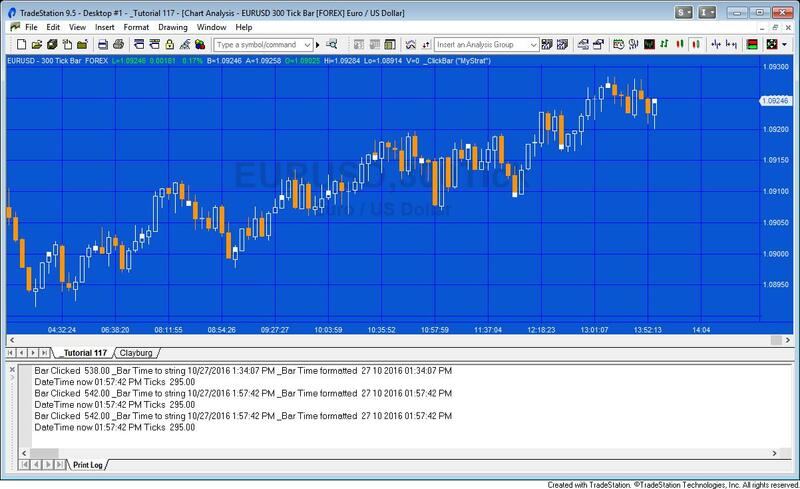 In tutorial 111 we used the ChartingHost to detect when we clicked on drawing objects and calculated the cumulative volume for the bars encompassed by the trend lines (trend line volume) for trend lines drawn using the TradeStation drawing tool. This tutorial detects when we click a particular bar and also provides information about the bar we clicked. Tutorial 117 is available for IMMEDIATE download for $19.95 by clicking the ‘add to cart’ button. After download the program can be opened, you will be able to see the program code and modify it if you wish. After purchase you will be redirected to a download page, so don’t close the browser. 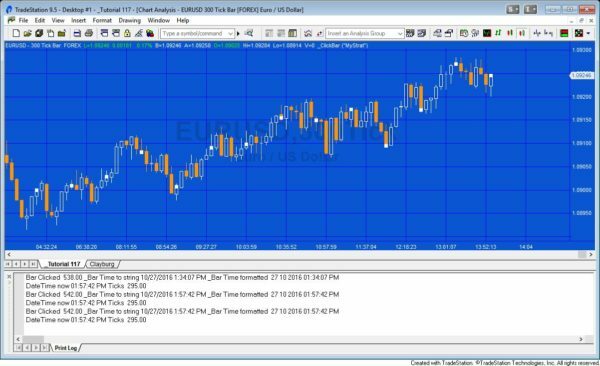 Tutorial 117 was developed for TradeStation 9.5 (update 15) and, unfortunately, will not work with MultiCharts.